This is a method used about 10 years, that will handle the varicose vein disease from the inside of the veins. This will require catheter, such as laser or radiofrequency catheter. Endovascular therapy is a patient-friendly alternative to surgical vein stripping. During the treatment, you will lie on your back. There is a puncture, only in special cases, a small incision above the knee or at the ankle is performed to insert the laser fiber into the vein. Through these catheter the fiber is then inserted into the vein. Endovenous laser or radio-wave therapy is a minimally invasive method for the treatment of varicose veins. In both methods, hardly any scarring occurs. Before and during the operation ultrasound studies are carried out using the duplex ultrasonography to determine the vein diameter and thus select the appropriate energy. During operation, the position of the catheter is checked via ultrasound in order to ensure the deep venous system side effects and verify the result. The endovenous laser and radio wave therapy is performed on an outpatient basis under local anesthesia. Usually the patient can resume his normal activities immediately after the procedure. Wearing compression stockings is recommended for 10 days. A check is still performed after 1-3 weeks and 3 months. 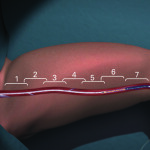 The laser catheter method works with high temperatures at the catheter tip. By the laser irradiation, the inner vein wall is heated up and thus intentionally damaged. The treated vein glues after treatment, thereby closing the vein and the pathological reflux of venous blood is avoided. The sealed vein hardens initially formed completely in the course of a few months back and is broken down by the body and converted into connective tissue. It can leak blood into the surrounding tissue and often form very extensive bruising (haematoma). The radio wave method (also known by the proper name “VNUS Closure” or “Closure Fast”), however, is both very efficient, on the other hand very gently. 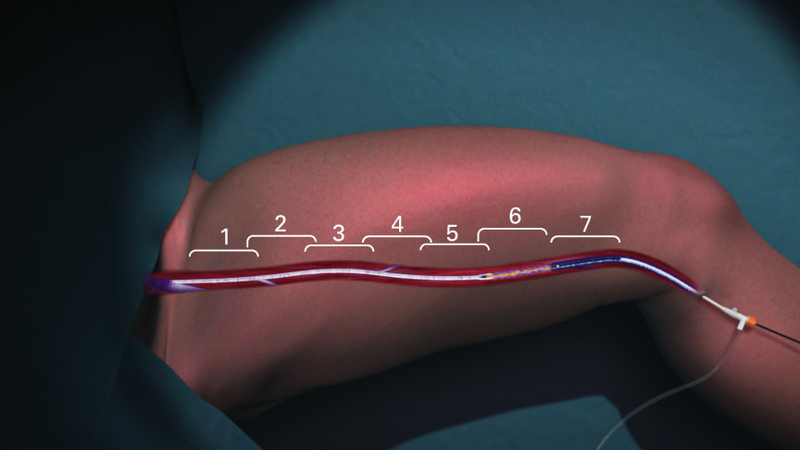 Here, a precisely controlled temperature is generated at the catheter tip which acts a period of time before the catheter is drawn back (followin image), in order to be brought again to the set temperature for a very smooth closing of the treated vein, without distortion of the surrounding tissue. The sealed vein hardens initially, and completely in the course of a few months, beeing converted into connective tissue. Specific laser complications: bleeding, rebleeding, very rare perforation of the vein with the catheter, bruising, pain, swelling, burns, injury to nerves, blood vessels and adjacent organs, infection, thrombosis, embolism, impaired wound healing, unwanted scarring, tissue hardening, varicose vein recurrence, irregularities in skin texture, pigmentation of the skin, very rarely no closure of the vein can be achieved. Minor and major bleeding resolve after 2-6 weeks. Only rarely a bruise (haematoma) must be treated surgically. Rarely hypersensitivity reactions to anaesthetics take place. Further, nausea, itching or skin rash, in most cases they resolve by themselves again. In very rare cases allergic reactions ranging from skin, mucous membranes, heart, circulation, kidneys or nerves can be caused (eg, mucosal swelling in the larynx, asthma attacks, circulatory collapse or shock) that require hospitalization. You can possibly lead to life-threatening intermediate cases and cause permanent damage caused by lack of blood perfusion of organs (eg, kidney failure and nerve palsy).